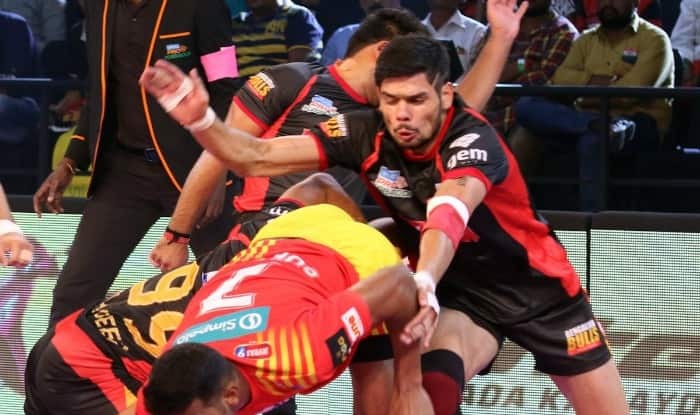 Bengaluru Bulls wrapped up their league stage campaign in style as they beat Jaipur Pink Panthers 40-32 in a Pro Kabaddi League (PKL) clash at the Netaji Indoor Stadium in Kolkata on Thursday. Bengaluru Bulls topped the table in Zone A and once again it was Pawan Sehrawat who led their charge. Sehrawat scored 16 points and was ably supported by Rohit Kumar, who chipped in with 5 crucial points. For Jaipur, Deepak Niwas Hooda with 13 points top scored beside reaching the 700-raid point mark in the history of the league. It was a disappointing end of the league campaign for Jaipur Pink Panthers as they finished fifth in Zone A.
Sumit Singh picked up a two-point raid to get Bengaluru Bulls going as they led 3-1 after two minutes. Deepak was the key man for Jaipur in the first half. Both teams were neck and neck for majority of the first half. After 10 minutes of play, both teams were level at 8-8. Bengaluru changed gears in the last five minutes of the first half with Pawan Sehrawat picking consecutive raid points. In the 19th minute, Bengaluru inflicted an all-out to lead 19-14 but Jaipur scored two quick points in the 20th minute to end the first half strongly. At the end of the first half, Bengaluru Bulls led 19-16. Bengaluru started the second half strongly with Rohit producing a super raid in the 27th to lead 25-18. Jaipur forced an all-out in the next minute to reduce the deficit to just five points. With just over five minutes to go, Pawan picked up a two-point raid to give Bengaluru Bulls a 29-24 lead. Bengaluru Bulls then inflicted an all-out in the 37th minute to ensure their victory.